The D.C. Record Fair, one of this blog's favorite semi-regular cultural events, is back in D.C. after a stop in Rosslyn in October. The next fair takes place Feb. 12 at Riot Act Comedy Theater in Chinatown. Entrance fee is $5 if you show up during the first hour (before things get picked over! ), and $2 after that. According to the invite, there'll be more than 40 vendors, plus, um, bloody marys. Co-organizer Jon Meyers, of the Vinyl District blog network, says the event will be spread over the venue's ground-floor lobby and basement theater. (The other organizers are Som Records and DC Soul Recordings.) Guest DJs are TBD. Riot Act, which has a pretty large, pretty choice location at 801 E St. NW, still feels too big to be a comedy club (at least to my eyes), but it's announced plenty of interesting non-comedy bookings, like a comedic mini-festival put on by D.C. Shorts and, I'm just noticing, a trivia night. Maybe I should check that out. The D.C. Record Fair takes place noon to 5 p.m. Feb. 12 at Riot Act Comedy Theater. 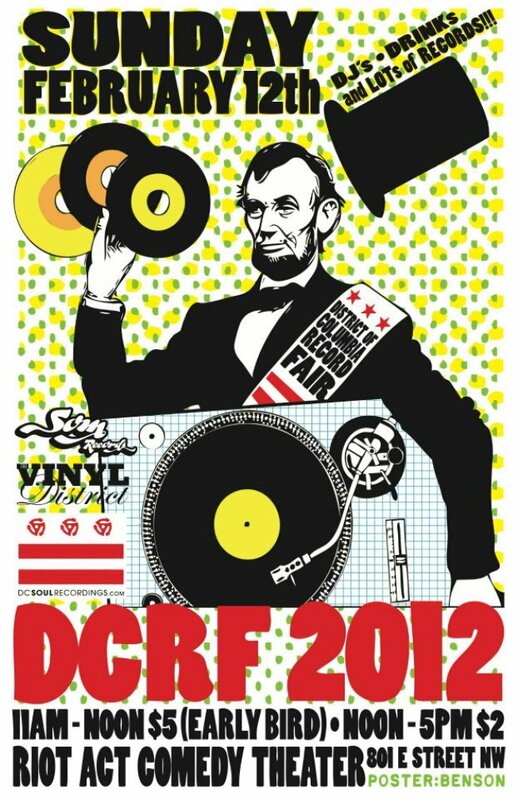 D.C. Record Fair Is Back on Feb. 12 was originally published by Washington City Paper on Jan. 16, 2012.